Traditionally, most people think of Greek mythology in terms of the gods of Mount Olympus, as lead by Zeus. In recent years though, there has been a re-emergence of knowledge about the Titans of Ancient Greece; the Titans being a group of gods who came before Zeus and the other Olympian gods. This reawakening has been helped by Rick Riordan’s Percy Jackson & the Olympians series, as well as Legendary Pictures’ Wrath of the Titans. Sources in antiquity would often contradict each other when it came to the time line of Greek mythology, but taking Hesiod’s work as a base, a general outline can be put together. First came the Protogenoi (first born) gods, who included the likes of Gaia, Chaos, Tartarus and Eros. Gaia would then give birth to a son, without a mate, this son was Ouranus (Uranus). Ouranus was given dominion over the sky, and it was he who first took up the mantle of supreme ruler of the cosmos. Taking Gaia as his mate, Ouranus would become father to a number of children. First came the three gigantic Hecatonchires, and then the three single-eyed Cyclopes. Ouranus was scared of the power of these sets of brothers, and so to preserve his own position, he imprisoned them in the depths of Tartarus. Fear for his own position did not keep Ouranus from fathering another set of siblings with Gaia though, and so came forth the twelve Titans, six male Titanes and six female Titanides. 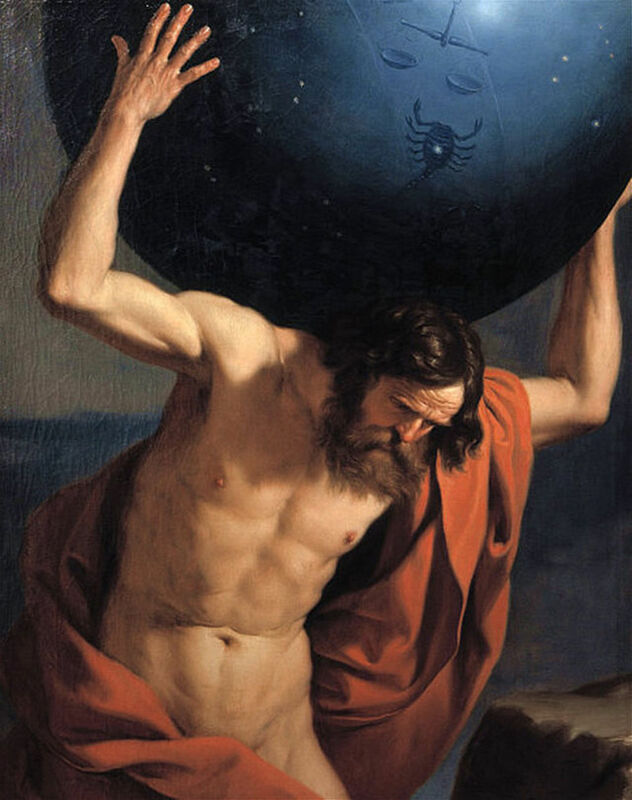 The male Titans were Cronus, Iapetus, Oceanus, Hyperion, Crius and Coeus, whilst the females were Rhea, Themis, Tethys, Theia, Mnemosyne and Phoebe. Ouranus was less fearful of the Titans than he had been of the Hecatonchires and Cyclopes who had gone before, and so the supreme god allowed them to remain free; something which would prove to be a rather large mistake. The pain of keeping the Hecatonchires and Cyclopes imprisoned within her was upsetting to Gaia, and so she hatched a plan to overthrow Ouranus. When Ouranus next came down to mate with Gaia, the male Titans, aside from Cronus, held the sky god down at the four corners of the earth. Cronus then took up an adamantine sickle that had been crafted by Gaia, and castrated his father. Ouranus retreated to the higher echelons of heaven, with some of his powers gone, and now with the inability to mate again. From the blood of Ouranus came forth the Meliae, the Gigantes and the Furies, whilst from the castrated member Aphrodite was born. Cronus would take over the mantle of Supreme Being, after all he was the one who had wielded the weapon against his father, and his Titan siblings were all given responsibility over different areas of the cosmos. Cronus and Rhea became rulers of everything, Iapetus and Themis were rulers of craft and justice, Oceanus and Tethys ruled the waterways, Hyperion and Theia were given dominion over light, Crius and Mnemosyne were in charge of thought and memory, and Coeus and Phoebe were in charge of intelligence and prophecy. 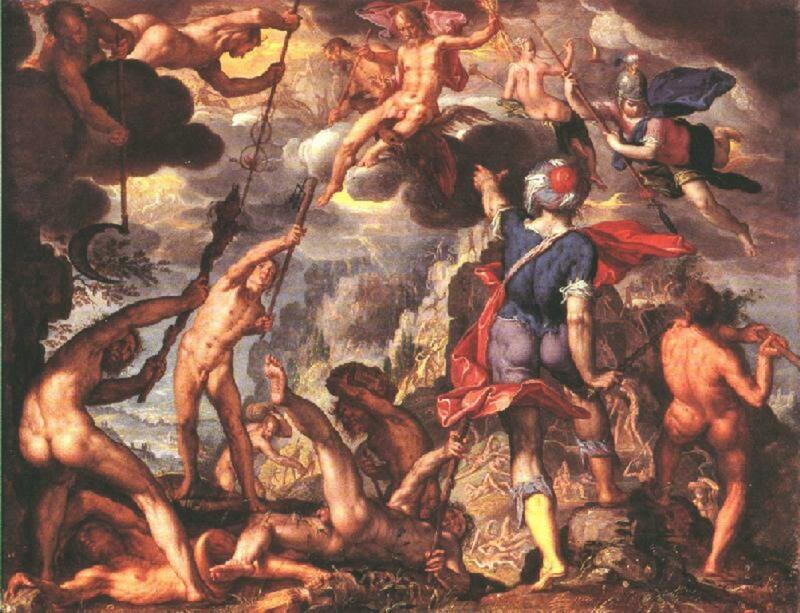 The period of rule of the Titans was regarded as the “Golden Age”, and everyone prospered. Many of the offspring of the Titans would be regarded as Titans in their own rights. These second generation Titans were the four sons of Iapetus, Prometheus, Epimetheus, Atlas and Menoetius; the daughters of Coeus, Leto and Asteria, and the children of Hyperion, Helios, Eos and Selene. Cronus was no more secure in his position than his father had been, and so despite the wishes of Gaia, he kept the Hecatonchires and Cyclopes imprisoned in Tartarus. 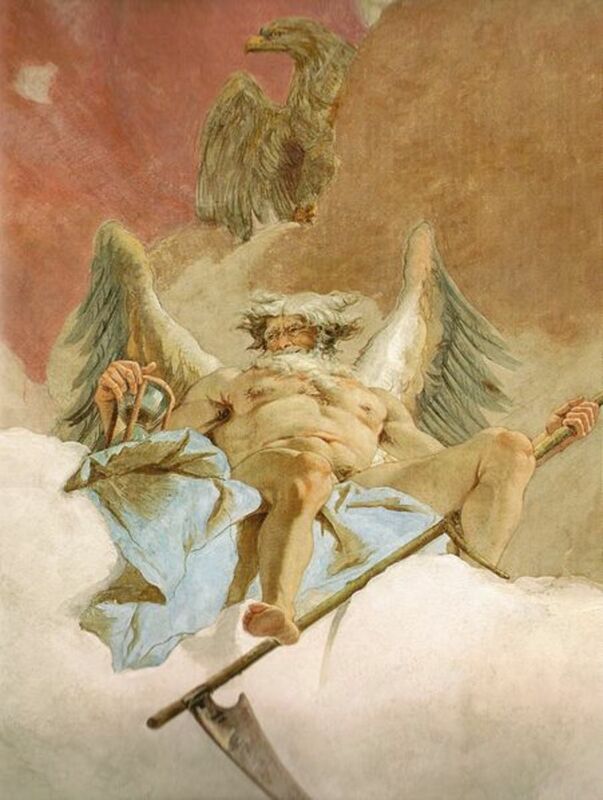 Cronus was not about to make the same mistake as Ouranus, and he also imprisoned his own children; indeed a prophecy had been told of how his own child would overthrow Kronos. As each child was born to Rhea, Cronus would swallow the baby whole, making his own stomach a prison. Thus, Demeter, Hestia, Hera, Hades and Poseidon were all swallowed; a sixth child, Zeus, would have followed his siblings, but Rhea, with the assistance of Gaia, substituted a wrapped stone in his place. The newborn Zeus was then spirited away to Crete. 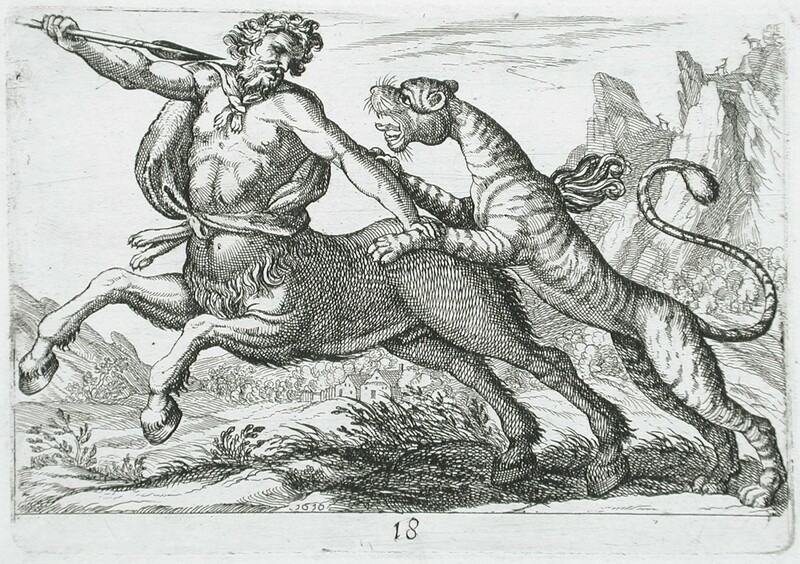 Cronus was oblivious to the fact that Zeus was on Crete, and so his son grew up, growing in strength and power as well. Eventually Zeus was strong enough to think of challenging his father, but first he sought to release his siblings from their prison. This Zeus did with the aide of a potion that forced Cronus to regurgitate his stomach contents. With his siblings by his side, Zeus now had a fighting force, and war between the Titans of Mount Orthrys and the gods of Mount Olympus began. On one side were the male first generation Titans, aside from Oceanus, (the female Titans did not take an active role in the fighting) aided by the likes of Atlas and Menoetius, against Zeus and his siblings, who had the newly released Hecatonchires and Cyclopes on his side. The Hecatonchires and Cyclopes were ultimately pivotal in the fight, as the Hecatonchires could fling a hundred mountains each at one time against the Titans, whilst the Cyclopes crafted the weapons used by Zeus and the other Olympians. Hades’ helmet allowed for the wearer to be invisible, and this would allow the god to destroy the armaments of the Titans, bringing to a close the ten year Titanomachy. The defeated Titans were punished by the victors. 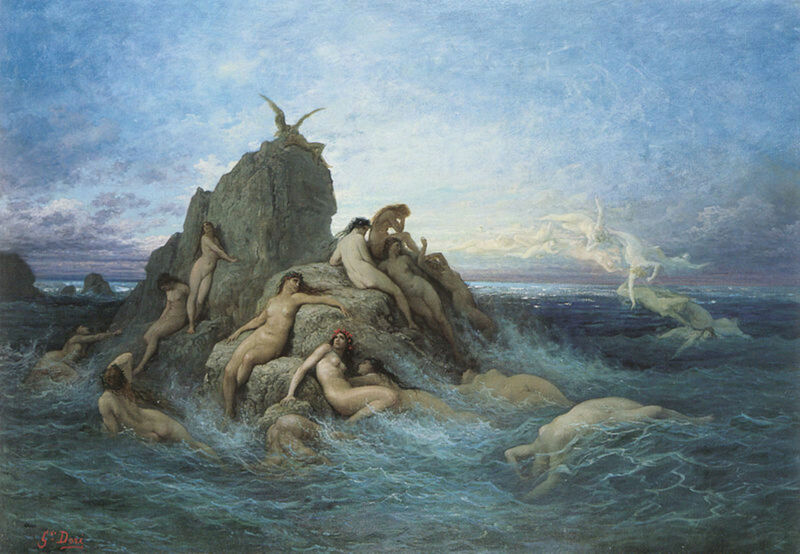 The female Titans were not punished as they had not fought against Zeus, but their importance faded, with the rise of other deities; similarly Oceanus was not punished by Zeus. 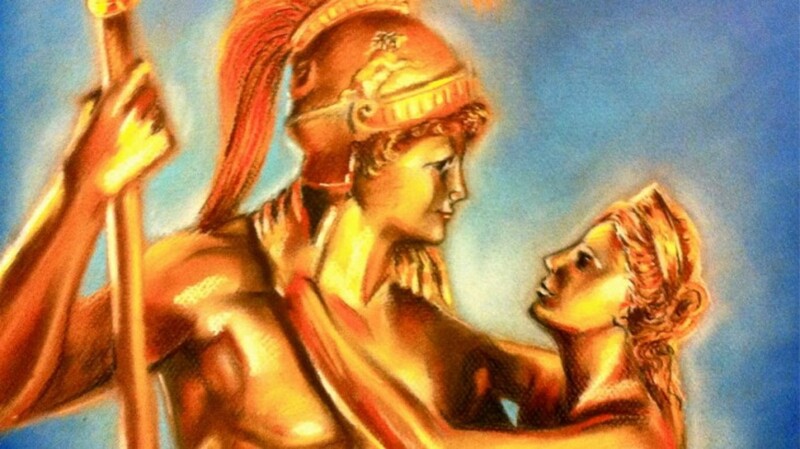 Prometheus and Epimetheus were also allowed to roam free as they too had not raised weapons against the Olympians, although they would be punished later for their own indiscretions. 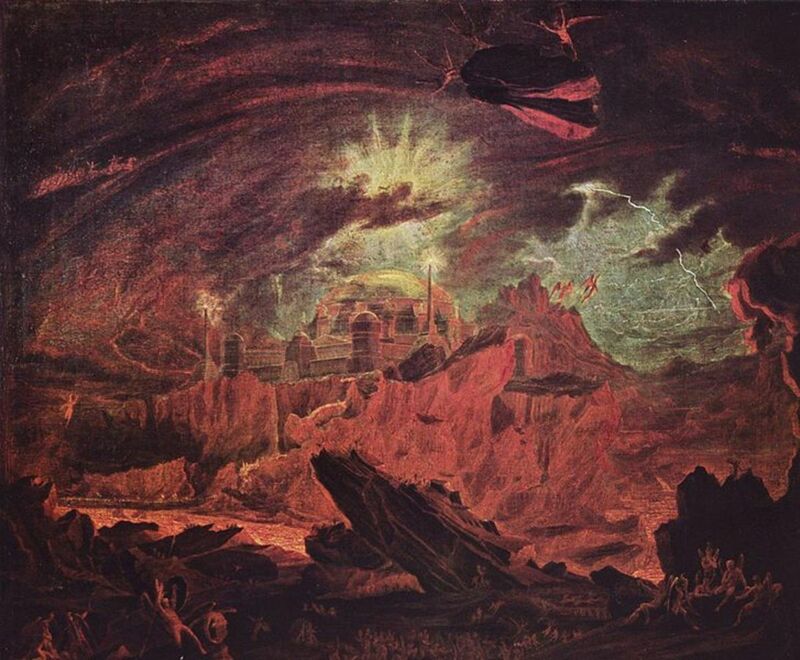 Cronus, Coeus, Crius, Hyperion, Iapetus and Menoetius were all sent to the prison of Tartarus, where they would spend eternity. Their guards would be the former inmates, the Hecatonchires. Special punishment though was set aside for Atlas, the second generation Titan, who had lead the Titans on the battlefield. This Titan was tasked with holding up the heavens for all of eternity. The Titans are now generally classed as the villains of Greek mythology, but before the rise of the Olympians, these gods ruled the cosmos, a period that was synonymous with prosperity.